Ten Speed Press, 9780399581649, 208pp. A handbook for effective activism, advocacy, and social justice for people of all ages and backgrounds. Are you ready to take action and make your voice heard, but don't know how to go about it? This hands-on, hit-the-ground-running guide delivers lessons on practical tactics for navigating and protecting one's personal democracy in a gridlocked, heavily surveilled, and politically volatile country. If you want to start making a difference but don’t know what to do next, Road Map for Revolutionaries provides the resources needed to help you feel safer, more empowered, invested in, and intrinsic to the American experiment. The book addresses timely topics such as staying safe at protests, supporting marginalized communities, online privacy, and how to keep up the fight for the long term, breaking down key issues and outlining action steps for local, state, and federal levels of government. ELISA CAMAHORT PAGE, one of the early advocates for social media as a communications and marketing tool, cofounded the pioneering women's media company BlogHer. As part of the founding team, Camahort Page was recognized by Fortune, Forbes, and Fast Company, among others. CAROLYN GERIN is the creator/art director of the best-selling "Anti-Bride" series from Chronicle Books. She leads Cannawise.co, a strategic branding firm for companies in the B2B and B2C cannabis industry. JAMIA WILSON is the director of the Feminist Press. Wilson has contributed to the New York Times, Today, CNN, and more. She is the author of Young, Gifted, and Black and wrote the oral history in Together We Rise: Behind the Scenes at the Protest Heard Around the World. "Road Map for Revolutionaries answers all the questions you were afraid to ask, plus some you never thought of. It's portable, requires no batteries or electricity, and was created by three smart women. I recommend it!" "In one sentence I felt empowered. 'Courage is contagious, and when everyday revolutionaries speak out and come together in solidarity, our mighty power expands exponentially.' Road Map for Revolutionaries gives step-by-step instructions on how to cultivate this courage, what to look for and why it matters." 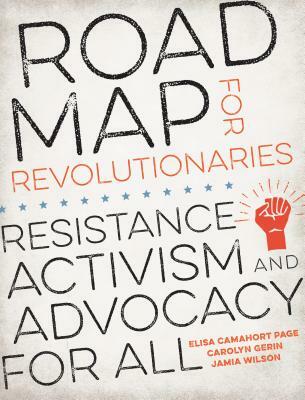 "Road Map For Revolutionaries will become THE tool in your toolbox that is irreplaceable in today’s world where advocacy and activism are daily essentials. This new book co-authored by three brilliant women gives you the perfect template for supporting your chosen causes when you have run out of ideas of what more can you do. For young and mature audiences alike, you will want to buy for all those you care about." "Being an ally is one of the most important aspects of my life. Social Justice has never been an easy thing to fight for, but it has gotten exponentially harder since 2016. It's so easy to become overwhelmed. This guide helps me feel empowered, and makes positive change seem less daunting. As a single mother of a cisgender, white, most likely straight male, my job as an ally has become that much more important. Not only do I feel the responsibility to stand up for and behind marginalized people, but I also have to teach my son how to do the same. Mostly my role as a parent seems to be to unteach him the lessons he learns out in the world every day. Our culture tells him wherever he looks that he has more rights and privileges than almost every other group. Road Map for Revolutionaries provides an excellent jumping off point for me to better understand and explain our positions and responsibilities in our culture and gives me practical steps for getting us both involved in making the world a better place." “The revolution must be financed. By definition, the system being fought against is much more lucrative than you, the angry mass(es). Chapter 3 lays out a step by step process for direct action with the sharpest spear, the dollar. This misunderstanding of your own financial power is the quickest way toward defeat in today's point and click protests. The backbone of the western world is money. History shows us that all of the rebels and revolutionaries began with securing money first. From Christopher Columbus and George Washington, to Fidel Castro and even Isis, they all started with capital. Money equating to power has been a close value to me throughout my life from firsthand experience. My mother shut down a lunch counter with fellow students active in SNCC. I am happy to see this comprehensive roadmap to aid the next generation who are, unfortunately, facing some of the same injustices past generations had to combat. " "What a timely book this is, especifically for this new majority of multicultural and intersectional millennial and Gen Z generations, who care so much about democracy, equality, representation and access, but many times don’t know were to start or what they can do to contribute to make our country a better place. Donating money, signing potions and attending marches are all very important, but this book gives readers so many other examples of how everyone can make a difference, even teenagers, from the comfort of their phone! —Beatriz Acevedo, President, Acevedo Foundation and founder, mitú, Inc.